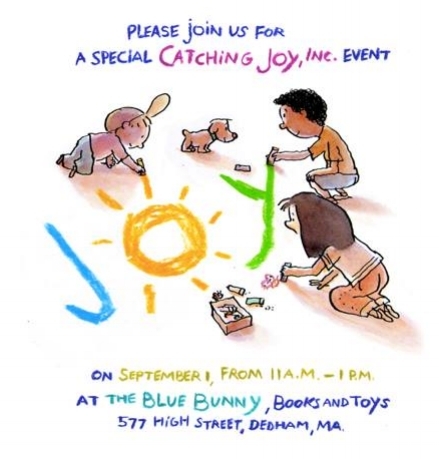 Join The Blue Bunny Bookstore in Dedham, MA, for a special Catching Joy, Inc. event on Friday, Sept 1, from 11 a.m.-1 p.m., featuring author Holly McGhee and illustrator Pascal Lemaitre will share their new picture book, "Come with Me." On Friday, Max, of Catching Joy, is inviting kids, teens, and families to make decorate hearts and make posters with positive messages to help people in need. Holly McGhee and and Pascal Lemaitre will share their new picture book, "Come With Me," and the message that kids can do little things that make a difference. Children's musician Stacey Feist Peasley will play music, and we'll celebrate with rainbow cupcakes and lemonade. The event is supported and powered by Lady Gaga's Born This Way Foundation and Peace First, and Max is honored and grateful to receive the "Channel Kindness" award. FUN and FREE and everyone is welcome! but RSVPs are greatly appreciated for planning purposes. To RSVP or for more information, contact Joy and Max, joy@catchingjoy.org. Please bring new socks to donate!